A+E Networks UK broadcasts a portfolio of leading factual and entertainment brands: HISTORY®, Lifetime®, Crime + Investigation®, H2® and the very first UK free to air entertainment channel, BLAZE™. We caught up with Karl Burnett, VP HR Director and Elaine Jackson, Head of Office & Facilities Management, at their impressive 20,000 sq ft office at 1 Queen Caroline Street in Hammersmith, to discover just what makes A+E ‘The Best Place to Work in Television’..
1. HOW HAS THE COMPANY EVOLVED OVER THE YEARS? Before we moved to Hammersmith, A+E Networks UK were based in Brentford whilst A+E International – a division of our shareholder company – were based in Mayfair. This reinforced the separate nature of these two companies. We set out to make these two companies into one team under the same roof with the help of DeVono Cresa. 2. 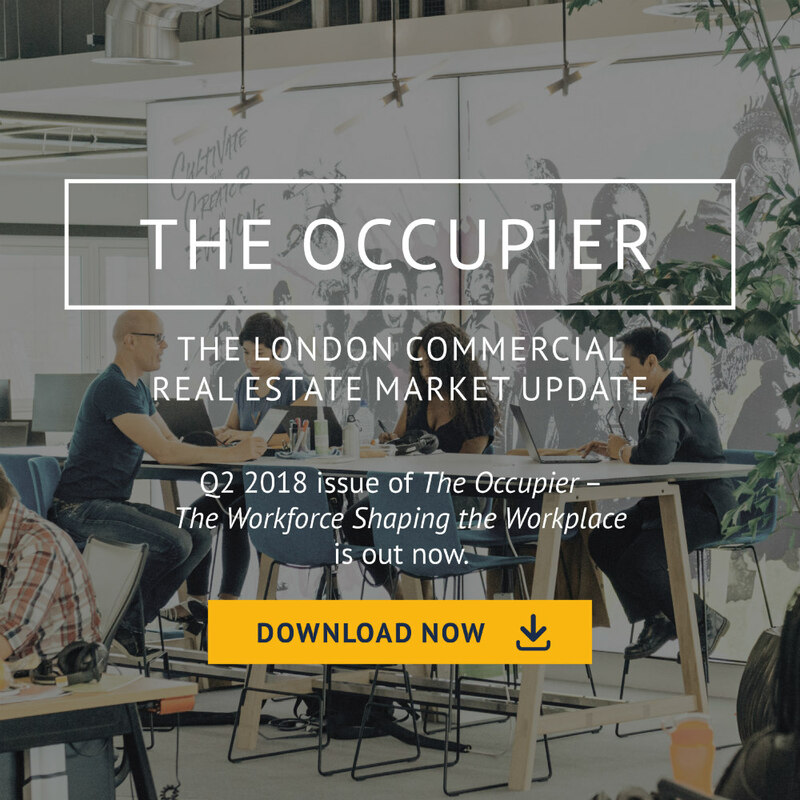 WHAT LEVEL OF INFLUENCE DID THE WIDER WORKFORCE HAVE ON DECISIONS MADE ABOUT THE NEW OFFICE SPACE? We spent a lot of time researching the different considerations – the location, accessibility, size etc. We wanted to be close to Heathrow and be surrounded by other media companies. We also looked at our own workforce – where they lived and what their access would be to different postcodes. All of this information was taken into account. 3. HOW DID YOU CONTINUE TO ENGAGE WITH THE WORKFORCE THROUGHOUT THE PROCESS? Once the decision was made, we appointed ‘Move Champions’ who were heavily involved in the entire project, from helping determine whether to go towards ‘agile working’ or not – to choosing the office furniture. We also developed a communication app for the move, so employees could access information about the new environment and the local area. The app could answer any question employees might have, such as ‘how to get post out the building’ or ‘how to welcome a visitor’. In fact it went down so well that we have continued to use the app. 4. WHAT DOES AGILE WORKING REALLY MEAN? It’s a bit of a cheesy phrase, but it means that we don’t have a dedicated desk space per person. Instead, we have ‘stations’ for different activities – so employees can choose the right space for what they need that day. 5. WAS AGILE WORKING ALWAYS PART OF YOUR STRATEGY? We had some limitations around budget and how much space we could invest in. So we thought – do we want to fill that space with desks and everyone has a desk? Or do we want to have a more creative and collaborative space. This strategy meant that we could have fully functioning edit suites (Ronny and Reggie after the Kray twins), an Ingest area, which brings content in and out for transmission, plenty of collaboration spaces, phone booths and the huge Blaze Boardroom. In the end we moved to roughly a ratio of 7 desks per 10 people – knowing that not everyone will always be in the office and they may not always need a desk. 6. HOW HAS IT IMPACTED THE CULTURE AT A+E? It has been hugely positive! It allows people to work in a much more collaborative way. It breaks down silos between departments and removes hierarchy. Employees are much more likely to know people outside their teams. There is definitely a vibe and energy that comes from bringing different people together each day. 7. HOW DO YOU REVIEW EMPLOYEE ENGAGEMENT? We conduct a number of surveys, aiming to capture any useful suggestions on how we can make our space even better. We also have Elaine, who is incredibly close to the workforce on a day-to-day basis. Everyone knows that they can go to her with new ideas, questions or issues. As someone who really embodies the culture here – Elaine has the authority to make improvements – without getting snagged in a lengthy approval process. 8. DO YOU VIEW THE WORKPLACE AS A MEANS OF RETAINING AND ATTRACTING TALENT? There is no doubt that the workplace environment is key. Our new office space is about matching our ambitions, both creatively and commercially. People love the space, they are proud to work here and it has definitely had a positive effect on retention. Our location also plays a part – we are directly on top of Hammersmith Underground Station and surrounded by other media agencies. It’s a sociable and easily accessible place to work. 9. DO YOU SEE YOUR WORKPLACE STRATEGY CHANGING? Just one of the many advantages of agile working is that it allows us real resilience. As departments change or emerge we can adapt much easier and quicker. It provides true flexibility, right now and for the future. 10. HOW DOES AGILE WORKING IMPACT THE DAY-TO-DAY? It promotes inclusive working. For example, the Senior Management Team, whilst they have access to focus rooms, most of the time they are out on the floor with everyone else. A trainee could be sat next to the MD in their first week. We’ve tried to think of everything to make working agile easy – everyone has a ‘Hot Box’ – in this goes their ‘whole world’ – laptop, stationery – everything they need for that day. And at the end of the day it is stored in their locker, ready for the next chosen location. As with everything there is always room for improvement and part of my role is to engage with the team on what could make their working day better. 11. YOU HAVE A GREAT COMMUNITY FEEL WHO DECIDES WHAT INITIATIVES YOU RUN? Most of the ideas are driven by employees. We have a Wellness Room – where you can have a massage, meditate, pray or just relax. We bring everyone together for social events every Thursday – making great use of the roof terrace. We have a (very talented) choir – which is open to everyone, we have a Tea Club, we host family events for parents to bring their children to and much more. We are always open to new ideas on how we can make the very most of our space. 12. HOW MUCH HAS THE WORKFORCE SHAPED THE WORKSPACE? It is amazing to see how much people enjoy coming to the office every single day. I’ve seen people even come in on their day off to join in the social events. By involving the workforce in the entire journey – from the old offices, through the relocation process and by continuing to gather feedback – we have created a truly unique space to work in. You can also watch the video interview below.